"These are tasty, easy, and great on gift trays. They are also very decadent looking." These are quick, easy, and very attractive looking once prepared, and tasty! 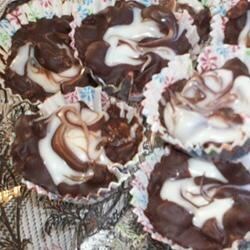 A very quick, easy and tasty candy that is very pretty. I added some chopped raisins to make it like the old Chunky bars and it was perfect.